After our wonderful couple of weeks in England, we came back to Bulgaria all invigorated and inspired with new ideas of what’s next for us. In a way it is time to work out what is the next bit expenditure. Well, as it turns out, there was no need for us to make that decision, as fate took it upon herself to decide for us. We were rapidly approaching the deadline to submit our company tax return, which meant a trip to Yambol to stand in a queue and eventually hand in a form. (Thanks to Lou for very good advice as to how to do that.) So off we went. Taking the usual shorter route avoiding Burgas, we were horrified to discover how extensively the roads had been damaged from the harsh winter we’re (finally) coming to the end of. Just interrupting myself for a minute, I did notice the roads in the UK had also suffered from this year’s snow, but really, if you haven’t been to Bulgaria where EU money allocated to road improvement tends to line the pockets of nepotists and crooks, you ain’t seen nothing. The ridiculous thing is you can’t see how deep the holes are until you’re on top of them. Which is why when we approached a particularly wide hole, we hoped we would be able to straddle it with our wheels. It was too late to change course when we realised it was the size of a grave…and the ominous rumbling sound when we came out at the other side meant only one thing. Actually two things. TWO tyres and both wheels on the right hand side had gone. B*gger. What now? 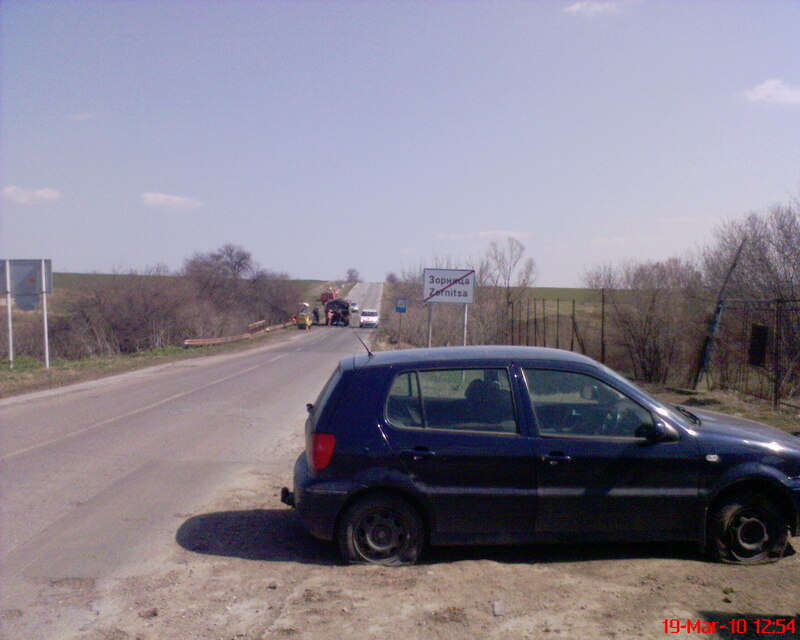 Here we were just outside a tired village somewhere in between Sredets and Yambol with two flats and only one spare tyre, not knowing the extent of any other damage to the car. Well as it happened, our networking in Yambol served us well. One call to our mechanic, Pavio, and he dropped everything, slung a couple of spare tyres in his car and came to our rescue. What a star! …and that is what our next spending priority turned out to be! was in yambol last week and the roads are very bad, i managed to miss the pot holes though.